The passenger car wheel rim has a solid and durable feature. It is used to replace aluminum wheel in a cheap price. We provide the size from 13''to 17'. According to the need of our clients, our research and development team have developed the passenger car wheel rim that is certificated by the ISO. Our method of final treatment: hot-dip galvanizing, line drawing with black and white, and power spraying. This passenger car wheel rim is mainly used in car, SUV, and MPV of small block, such as HONDA, TOYOTA, etc. The loading capacity of passenger car wheel rim is 3500 pound. 1.We provide various kinds of this product. 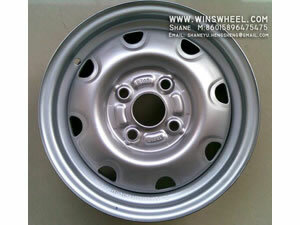 2.It has a stable quality and meets the standard of high-class wheel. 3.We have a technology team to ensure the high quality of all products. 4.To make sure that all products should be conducted fully, we possess a professional quality inspection team. Delivered within 45-60 days after you confirm the order. Wuxi Hengsheng Wheel Co., Ltd is a professional passenger car wheel rim manufacturer and supplier in China. We provide our customers worldwide with a wide range of steel wheel rims, such as snow steel rim (or winter steel rim), trailer steel rim (trailer wheel rim), mobilehome steel wheel rim, pick-up truck wheel rim, custom steel wheel rim (SUV/jeep steel rim), etc. All of our products have obtained ISO9001 certification, American DOT certification and German TUV certification. With innovative design and competitive price, our products have been well received by customers from America, Oceania, Middle East and many other countries. If you're interested in our passenger car wheel rim, please contact us freely.